Anker power banks are a bargain in Amazon's Black Friday sale. This year's Black Friday may not be until 23 November, but retailers are get involved nice and early, and we're starting to see some awesome Black Friday and Cyber Monday deals from big retailers already. As part of its first wave of early UK reductions, Amazon has launched a massive deal on Anker external power banks. 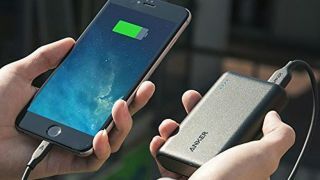 For more guidance on which is the right portable charger for you, take a look at our guide to the best power banks – Anker snags the top spot in our list with one of its newest models, but for a bargain price point and still-excellent performance, it's definitely worth checking out the models featured below. Anker's external batteries are known for being incredibly small (only a bit bigger than a credit card), and light – making them perfect for carrying around. They'll charge your phone or tablet up in super-quick time, so you'll never be left without power. Both of these models come with a micro USB cable included, but if you want to use them for your Apple products you'll need to purchase a USB-C or Lightning cable separately. Anker's power banks are extremely well-reviewed – at time of writing, the PowerCore 10000 has an average of 4.6 stars from just under 2,400 reviews, with 84% of customers awarding it 5 stars. But if you're not happy, both come with an 18-month warranty. Today only: Today (Thur 8 Nov), you can pick up the power bank for £16.71 rather than the usual £21.99 – a saving of almost a quarter. This is one of the smallest and lightest 1000mAh external batteries around. It's ideal if you want to charge your phone in super-fast time. Today only: This external battery holds enough juice to powerful up an iPhone 6s more than three times, and right now it's on sale with 20% off what you'd usually spend. It's a Deal of the Day (Thurs 8 Nov), so this bargain isn't sticking around. If you're after something to sit on your desk permanently, you can also grab a bargain on an Anker Wireless 5 charging pad. Today it's had 20% knocked off its price, taking it down to £13.59.